Recipes using cherries in the ingredients. 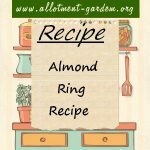 An Almond Ring is a perfect dessert for a special occasion. It's full of almond flavor with a lovely icing to provide that extra bit of sweetness. 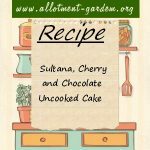 Recipe for Sultana, Cherry and Chocolate Uncooked Cake. Takes less than 30 minutes to make from start to finish and is ideal for making with children. Recipe for Jenny's Cherry and Oat Fingers. Can be served with a scoop of vanilla ice cream or custard but are amazing on their own. Recipe for Cherry, Fruit and Nut Slice. 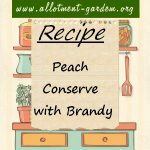 Recipe for Peach Conserve with Brandy. Makes about 5 lbs (2.3 kg) of conserve. A lovely gift. Recipe for Cherry Jam. Can be tricky to make, especially with sweet cherries, and may require adding pectin. Makes around 5 lbs (2.25 kgs) of jam.